Being a mom is hard work. We’re usually running from drop-off to pick-up and catching all the errands in between. Yoga pants just seem like the easiest thing. But, wait! What if I told you that fashion doesn’t have to be uncomfortable and that it is easy to feel good about what you wear. You need to find an Evereve! Pssst… you can even enter to win a $500 gift card at the bottom of this post. I had just dropped off my daughter off at dance class and my 4-year-old son and I had the afternoon free. “Hey buddy,” I asked him. I gently approached this because my son has been known to riot over shopping. Please. Please. Please be agreeable today. “Ya, I’ll go,” he replied. 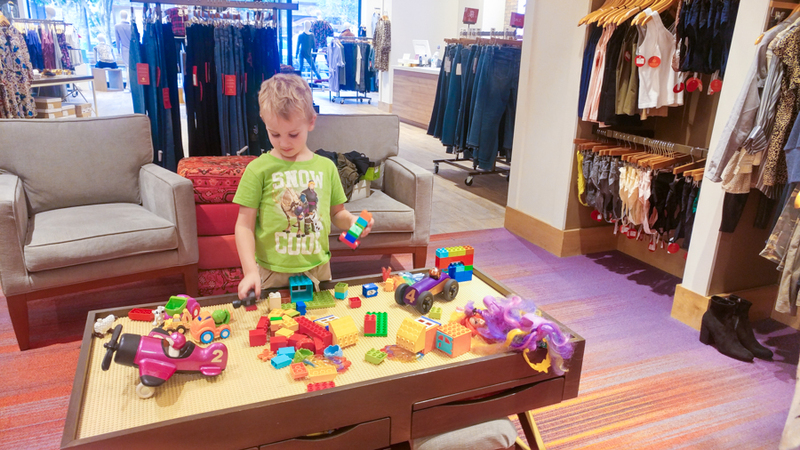 I buckled him in the car before he could change his mind and headed to Evereve in the San Tan Marketplace: a clothing store designed especially for moms with a kids play area, oversized dressing rooms and personal stylists to pick out outfits. Immediately, when I entered Evereve, I fell in love. And I’m not just saying over generalizing here. It seems like lately when I shop, no clothes appeal to me. In Evereve I found 2 tops – One a button-down sweater combo and the other a pinstripe blouse – that I pulled off the racks. A stylist, Britney, greeted me as soon as I walked in. I knew that we needed to take care of my son first because if he’s happy shopping, I’m happy shopping. We led him to a building table in the back of the shop near the dressing rooms. Britney also offered him some goldfish – which unfortunately we couldn’t take because of his dairy issues. Kim, the manager, heard this and said it was extremely good feedback. They hadn’t thought of kids with lactose intolerance when choosing the snack. 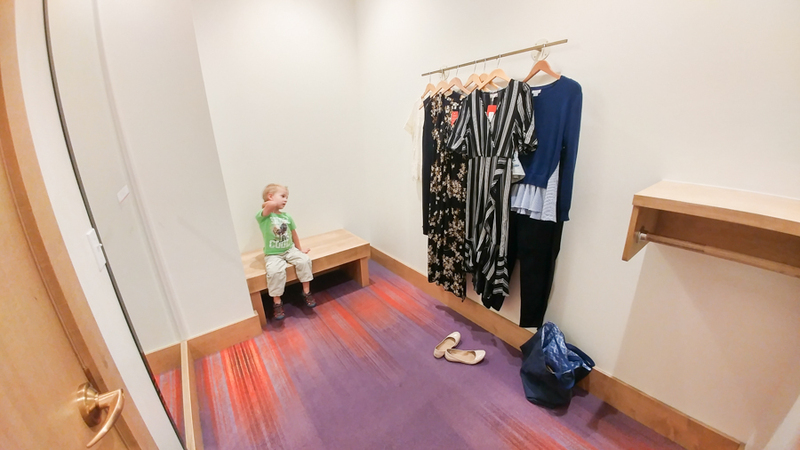 Britney pulled outfits for me to try on and I led my son in one of Evereve’s enormous dressing rooms! So much space. 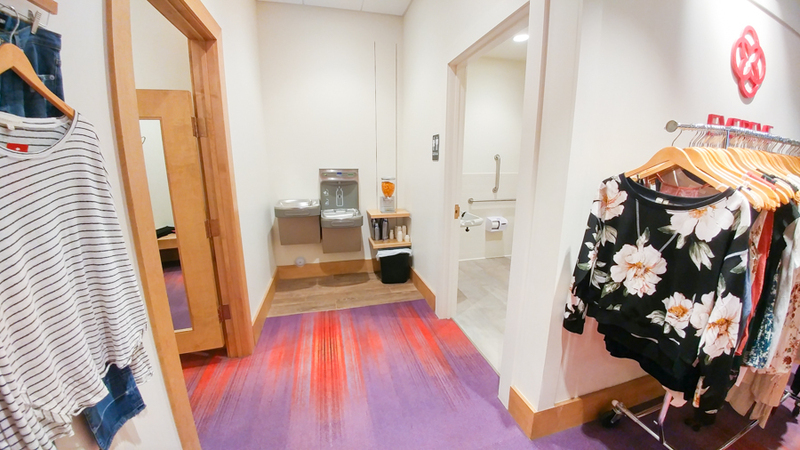 Of course, as soon as I started trying on clothes, my son needed to use the restroom. Kids always have perfect timing, right? I gathered up my things and prepared to take him to find a restroom in the mall, but Evereve had one in the store. In fact, right across from my dressing room. As a mom, you probably know how huge this is! In fact, as a Whimsicle reader, you probably know that I never go clothes shopping because my son is impossible to shop with. At Evereve, I was able to try on 10 different outfits! 10! And Britney, always took my personal preferences into every outfit she created. My stomach has been a huge issue for me this summer since I’ve gained some weight. So Britney brought loose, flowy dresses and cinched draw-waist pants. 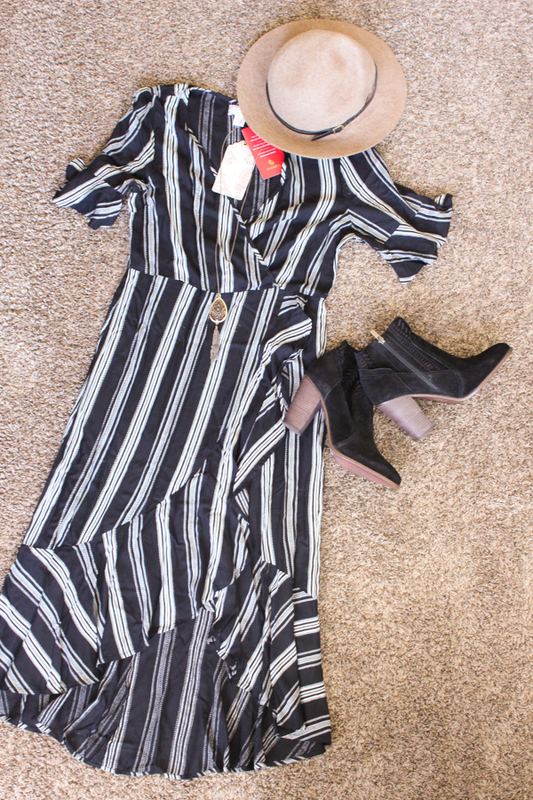 A flowy dress paired with black booties, a necklace and hat. 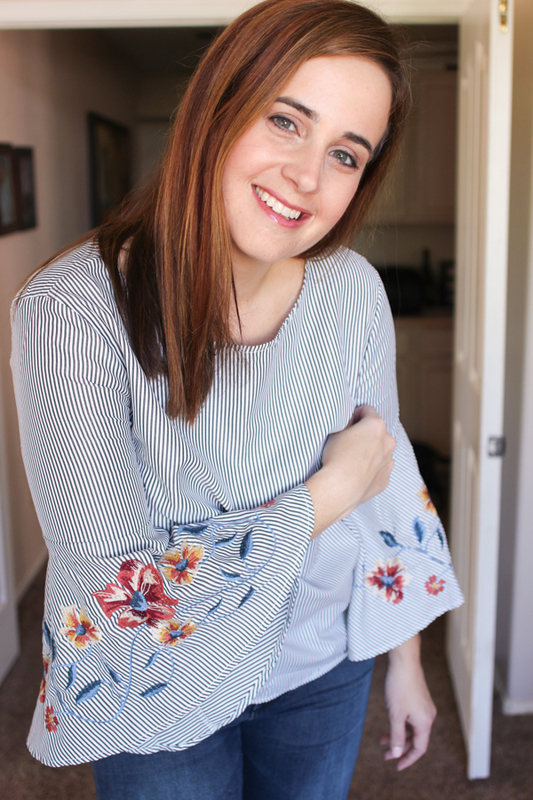 And a bell sleeved top with jeans and wedges, which you will see in the pictures below! This dress is not something I would pick out on my own, but I loved it when I tried it on. It was so gorgeous and comfortable. So comfortable that I also wore it to a baseball game that night. The usher – an older gentleman – remarked how he never sees people in dresses at the ballpark. Honestly, I was more comfortable in this dress than I would have been in a t-shirt and jeans. I’m digging the bell sleeves and floral embroidery. 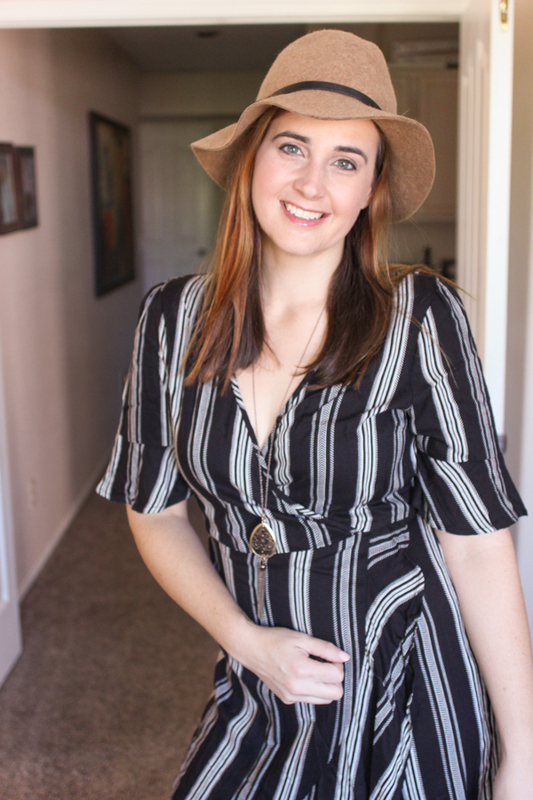 So feminine and yet the stripes give it a preppy vibe. 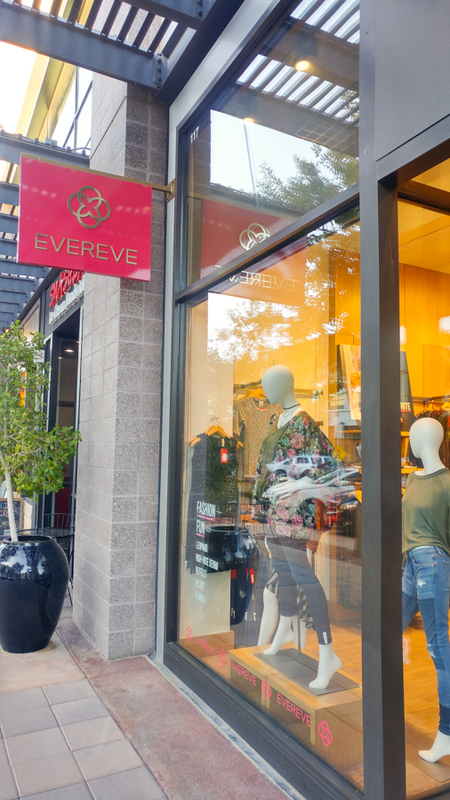 Evereve was such a fun shopping experience! I know that you will love it too! In fact, before you go, enter to win a $500 gift card from Evereve! This is the store you as a mom have been wishing for. Trained stylists, stuff for your kids, clothes you look and feel amazing in.. .what’s not to love? And with a message like, “Break through the stereotypes. 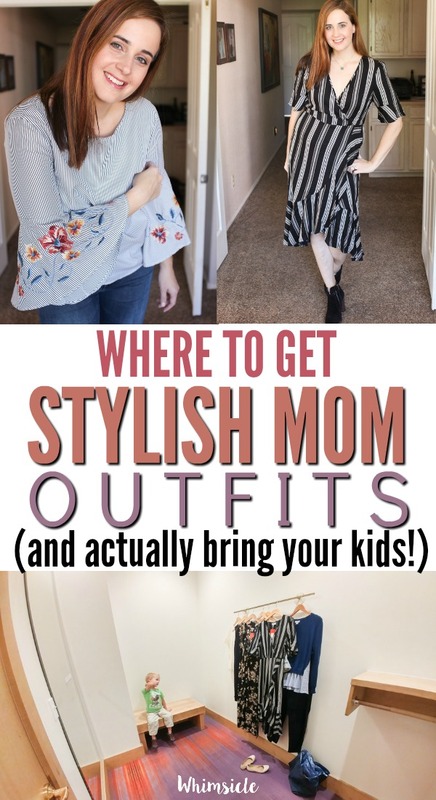 Moms are the most fashionable people we know,” you can expect to leave with an outfit you will feel phenomenal in. This store is fantastic! Not only did I get a couple cute mom outfits, but they completely loved on my son the entire time! I got to shop and my four-year-old was happy. You need to check this place out! You will love it.